“I like to see people smile,” says Margarita Espinoza, a volunteer at Ronald Reagan UCLA Medical Center. 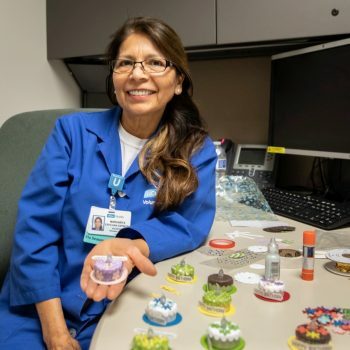 “I started making these tiny cakes for patient’s birthdays. The cakes are a candle with a little light and I think it helps the patients feel good. The first time I made one it took 20 minutes, but now it takes less time. It all depends on how many pieces you put on the top of the cake.